May 2012 - Kandrac & Kole Interior Designs, Inc. Welcome HOUZZ to Kandrac & Kole! Hello everyone! My name is Becky and I’m a contributor at Houzz, a home design site focused on helping design professionals and homeowners manage the remodeling and decorating process. Thanks so much to Joann and Kelly for having me! I was at a friend’s house the other day and he had the most wonderful shadowbox full of ticket stubs, funny little notes and small items that held memories for him. It got me thinking about how we store our memories. While old-fashioned scrapbooks and photo albums are great for keeping everything in one place, you won’t enjoy them on a daily basis. Your favorite personal items should not be sitting in a drawer, gathering dust in a closet or waiting for you to get to the framing store. You should be enjoying them in your home, letting the memories they bring up make you smile. Here are three ways to artfully display your sentimental treasures. A slew of snapshots. Framing can get expensive. 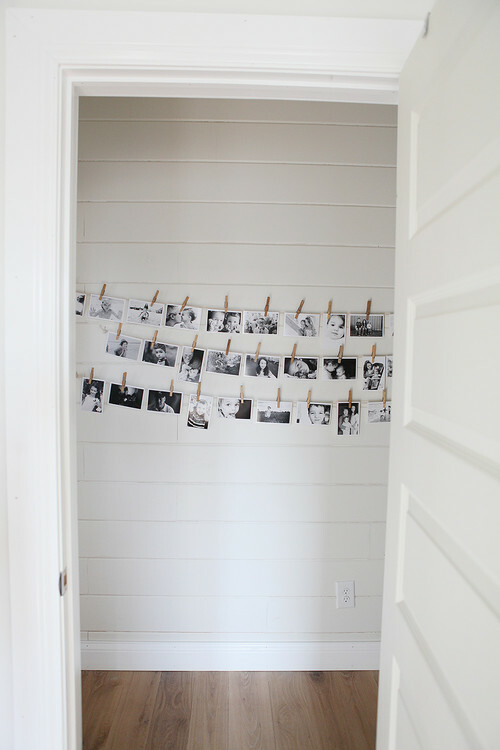 And besides, there are more fun ways to display your favorite snapshots. This family shows off their favorite black and white photographs with clothespins and wire. It’s a great way to show off lots of shots, and it’s a quick, easy and, best of all, free way to switch them up. eclectic living room design by los angeles interior designer Charmean Neithart Interiors, LLC. A special piece of clothing. A favorite personal item can inspire the decor of an entire room. 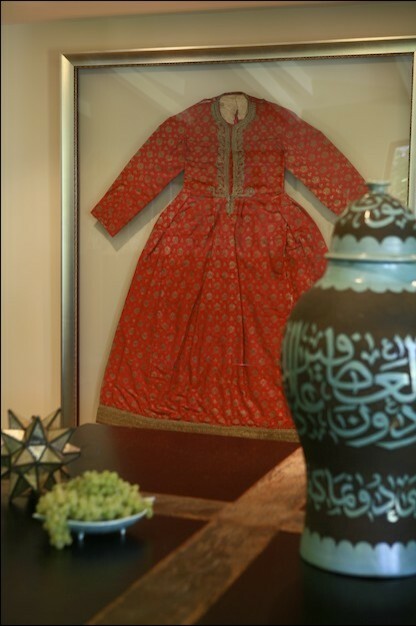 A client brought this very special dress her mother had given her to her interior decorator, Charmean Neithart. The client wanted a living room that “felt like this dress.” Not only did Neithart deliver, but she also had the dress elegantly framed in gold between two pieces of glass and added it to the room that it had inspired. Family correspondence and documents. Yellowed postcards, letters, birth certificates, deeds and other ephemera tell a story and connect you to your history. Don’t let them sit in a musty box; tack them to the wall and enjoy them out in the open. If putting them in the powder room makes you nervous, opt instead for a display in a hallway, bedroom, or other spot removed from moisture. How do you enjoy your favorite personal items around your home? Find more inspiration from Los Angeles interior designers and more design professionals around the world at Houzz. Boy we have a lot of Blogfest 2012 homework:) Well really, it’s another awesome opportunity born from our recent trip to NYC for Blogfest 2012 where the folks at House Beautiful asked those in attendance to post a photo representing their A-HA Moment. Here is mine – this is a photo of my family room that I redesigned last year. Why is was this an A-HA experience for me? Because it was the first time in my life that I invested in a piece of art. The painting above my sofa is an original by Kim Schuessler called Ring Around the Rosies. I’ve never been an art aficionado and could never really grasp the concept of spending thousands of dollars on a piece of art when there are so many ways to beautify a wall for less money. Then one day four years ago, I went to a Kim Schuessler show at Pryor Fine Art in Atlanta and that began a long standing love affair for me. I found Ring Around the Rosies at the Shain Gallery in Charlotte, N.C.. A few weeks before Mother’s Day, my husband drove all the way to Charlotte to personally pick up my new beloved. I seriously get teary when I talk about the experience of owning this piece of art. It reminds me of myself and my two girls (of course we are all blonde) and the care fee energy with which we approach life. In my design work, it helped me to learn the power that art can have over a person and the value of this type of investment on the soul. Definitely an A-HA Moment for me! Photography by Oana Hogrefe Photography. All rights owned by Kandrac & Kole Interior Designs. 1. BLOGFEST 2012 NYC sold out in a little over 4 hours with 168 attendees (63 of which returned after the first Blogfest last year). 2. 650 Blog posts were written after Blogfest 2011! How many will we write this year? 3. Carey Kravet has a very fancy iPad that is yellow with blue college ruled lines. 4. One of our sponsors, House Beautiful Magazine (my personal favorite magazine of all time) recently won the ASME (American Society of Magazine Editors) Lifestyle award for the first time in 116 years! Woohoooo! 6. Blogfest 2012 started with a kickoff party at the Kipps Bay Showhouse. After reading about this show house for years, we were beyond thrilled to get a chance to not only visit the Showhouse, but have up close and personal conversations with the designers. Our favorite new friend was Bryant Keller who designed the stunning foyer in that yum yum Scalamandre wallpaper! The iconic designer Charlotte Moss was also in attendance. I LOVED her bathroom design inspired by her love of French Gardens. 7. The fun and fabulous designer Scot Meacham Wood has over 485,890 Pinterest followers. Really Scot? Oh well, go ahead and follow him too – click HERE. And while you’re at it, follow Kandrac & Kole by clicking HERE. 8. If you want lush eyelashes that hit your eyebrows like uber famous, gregarious designer Alexa Hampton, Alexa recommends RevitaLash eyelash conditioner! 9. Here is your SAT lesson for the day – Alexa Hampton’s 4 favorite words: 1. Effulgent (shining brightly) 2. Euphonic (pleasant sounding) 3. Lugubrious (gloomy) and 4. Sanquine (cheerfully optimistic). 10. The dashingly handsome and talented Mr. Jon Call tripled his hourly design fee in the last several months and has never looked back – and yes the new projects just keep coming! 11. We spent a very fun afternoon at The Museum of the City of New York and heard from the Benjamin Moore’s trend forecasters in the world of COLOR. Here’s what you can expect to see in 2013: unabashed RED (and it’s sisters coral and pink), YELLOW (leaning towards Camel but also light and airy hues of yellow to mix with pink and coral), CHARTREUSE and APPLE GREENS, WATERY BLUES (influenced by Facebook and Twitter!) and more ORANGE. 12. More news from Benjamin Moore’s Color Pulse 2013 – Start waving goodbye to metallics, turquoise and black and white – huh?? 13. Another one of our sponsors, Glassybaby, manufactures my new favorite “happy”. Voted by Entrepreneur Magazine as the 2011 Entrepreneur of the Year, Lee Rhodes is a lung cancer survivor, mother, philanthropist and the good will ambassador behind this amazing company. Lee and her staff were kind enough to come to Blogfest 2012 and give each one of us a little bit of “happy” in the form of a Glassybaby hand blown glass votive. I was so in love, I purchased two more on the spot. To read Lee’s story and how her company has raised $911,207 for charities supporting the fight against cancer, click HERE. P.S. Get ready friends and family – this will be my gift of choice to give for years to come! 14. I wrote down so many great soundbites (stay tuned for another blogpost), but one of my favorites was by Designer Darryl Carter. In a panel discussion held at the impressive Hearst Home Group and moderated by VERANDA’S Editor in Chief Dara Caponigro, he said, “Muted palettes are actually very complicated if you study them.” So true!! 16. Being the textile addict that I am, I was beyond excited to tour behind the scenes at Kravet/Lee Jofa/Brunschwig & Fils. Hearing about the inspirations, the processes, the pride and talent behind each new fabric collection was a thrill! Of course I ordered samples of these two for my upcoming master bedroom redesign! 17. Our itineary goes on and on. At the Elle Decor Modern Life Concept House, I fell in love with this desk area because it’s hidden in an awkward alcove in the room which is a challenge I’m having right now with another client. 18. Party planning secret from the Modern Life Concept House (yes we were fed like Kings and Queens the entire week) – if you want to serve cruditaes so they spill over the bowl and look luscious like this, fill the bottom with clear marbles first! 19. To cap off this amazing week, we enjoyed a Farewell Celebration at the Museum of the City of New York where we could buy raffle tickets to win a smorgasbord of designer delicious items. Not only did I win ONCE but TWICE (and believe me, I never win anything!!) Ok, so I was just a tad excited (induced by sheer exhaustion and several glass of wine) to win the opportunity to blog for New York Spaces Magazine. What an honor! 20. Continue to follow us on Facebook, Pinterest, Twitter, YouTube and of our course our BLOG. We’ll be back again next year! Thanks again to Kravet for hosting this event! Tip #1: Guests will eat cupcakes before they will eat cake. The cake we had made by Miss Mamie was a work of art but the mini cupcakes were the hit. The favorite of the night? Coconut Lemon! Miss Mamie ships her delectable treats so check out her website: https://www.missmamiescupcakes.com/. We had a large clubhouse to decorate and the balloons were a great way to fill the empty corners of the room, frame the guitarist, act as a centerpiece and decorate the gift tables. The balloons added a lot of color and festive flavor. Party America made these great balloon “topiaries”. Another hint: Have them all delivered! The best $25 I’ve ever spent. Tip #3: Create a Gift Table that Celebrates the Past AND the Future. We had four kids at this party. Each kid had a “gift table”. Emory and her friend Summer are going to UGA. I found these great steel UGA tubs from Glory Glory. I gave them to my friend Joan to bedazzle (hey I know when to outsource!) I covered the table with a red floor length linen layered with a UGA plaid tablecloth on top. I filled the top with UGA shakers, a signature frame, UGA balloons and of course an ipad streaming photos of all the kids growing up over the years. The bucket was the perfect size for cards and small gifts. No plastic, ill fitting table cloths at this party – no way! Thanks to Rent All Plaza, we had our pick of perfectly pressed linens in all shapes, sizes and colors. The gift tables were in the kids college colors and the rest were white. Nothing to wash, nothing to iron – awesome! Tip #5: Keep guests animated with a digital slideshow. Thank you Apple for your wonderful products! A slideshow of all the kids over the years was hilarious to watch. Thanks to the power of Facebook, I was able to find Lerogie Sims who worked with Emory to create a playlist she liked and played for 3 straight hours (for a price I could afford!). He added great energy to the party. Thanks to the fantastic visual ideas on Pinterest, this photo wall was a hit! It’s a great way to involve the guests – we chose photos that showed all of the kids that were invited to the party. (Hint: Black and White looks much better). I chose these gorgeous red Lillies (UGA color of course) from Home Depot ($20 each). I then went back to the hobby store (Joann Fabrics) and bought wide grosgrain ribbon in UGA, UGSC and Liberty colors and had my friend Joan (aka my lifesaver) paint “Class of 2012” on them so that I could wrap them around each pot. I will be replanting these in my garden this week! Tip #9: Serve the Drinks Creatively! My friend Tammy came up with this idea. She bought three large galvanized steel tubs from Lowe’s. She then headed over to the florist shop and purchased wide jute ribbon to spray paint in the kids college colors. Cute huh? 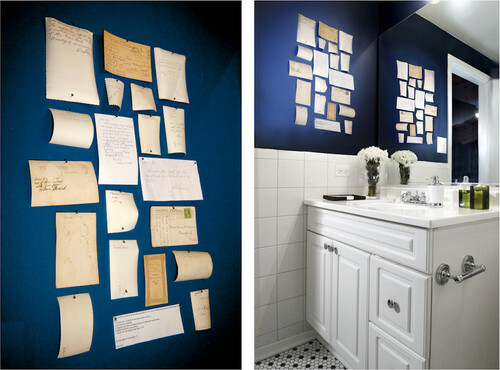 I saw this display of photographs at a Designer Showhouse several years ago and wanted so badly to copy it. I finally got around to doing it last weekend. I’ve been collecting silver for years, mainly from Scott’s Antique Market, Woodstock Antiques and ebay. I purchased this amazing display shelf from Highland House Furniture from the Royal Manor collection by Princess Diana’s butler, Paul Burrell. I saw it at Highpoint furniture market while on a buying trip and it was love at first sight! I knew it would be the perfect spot for the portrait collection. I placed it in my second floor hall that you can see from the entry foyer. Good old Tarn X did the trick…..
Now that I had the “frames” cleaned up, I needed to decide what photos to use. I scanned them on my printer into iphoto and edited them to black and white. I then had to cut patterns to fit the photos into the different sizes. Once I had all of the patterns cut, I traced the photos, cut them and then used sticky tack to adhere them to the trays. And here is the completed project!! I decided to add a succulent in a silver creamer for some interest. That’s my parent’s wedding photo at the top from 1953. Here is my daughter at the top and my granddaughter both at 2-1/2 years old! !